Ch.14: Guten Appetit! : Enjoy your meal! 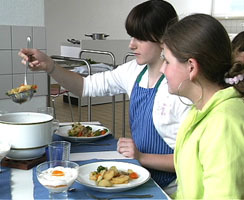 These pupils have cooked themselves lunch in a cookery class. Emily's family having lunch at home. This second section about food focuses on family meals. Pupils will learn more food words, extend their 'table talk' vocabulary and say what time they eat their meals. 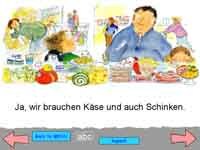 We see ordinary German families eating breakfast, lunch and supper; and find out more about the significance of food in everyday life and culture.